Versatile yet cost-efficient, this residential spiral staircase is Stairways, Inc.'s most economical fully assembled model. Capable of being tailored to fit a limitless range of spiral stair applications. 60" diameter standard metal spiral staircase pictured here provides secondary access that is compliant with building codes. 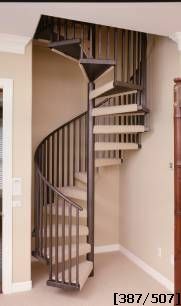 Fully assembled spiral stairs may be shipped whole or in sections for easy installation. When choosing spiral stair steps, matching flooring material to step material always works. For example, oak floors with oak spiral staircase steps. Stone flooring, stone spiral stair steps or as shown, carpet. Adding a covering on the steps could also help reduce noise. The carpeted steps shown were installed by the contractor onsite.